Epoxy coated shelves feature a carbon steel center, which is then treated with a zinc phosphate protection layer before the final epoxy layer is electrostatically applied. The surface contains an antimicrobial agent which prevents the buildup of bacteria. Create custom shelving racks, add individual shelves, or double the storage capacity of an existing wire shelving unit with a kit containing extra shelves, two posts and eight s-hooks. Connect multiple shelving units for back-to-back, side-by-side, U-shape, L-shape, and C-shape configurations when storage needs change. 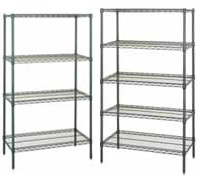 54" height Green Epoxy Wire Shelving units. Consists of 4 posts and your choice of 4 or 5 shelves. 63" height green epoxy wire shelving units. Consists of 4 posts and your choice of 4 or 5 shelves. 74" height green epoxy wire shelving unit. Consists of 4 posts and your choice of 4 or 5 shelves. 86" height green epoxy wire shelving unit. Consists of 4 posts and your choice of 4 or 5 shelves.